Continuing on the theme of mystery, one topic I’d like to take up is the use of literature textbooks in Catholic high schools. My experience, both as a student and teacher, has been with the ubiquitous, state-approved fare from big publishing houses. There are many problems with this type of textbook, all of which I won’t take up in this post, but I do wish to talk about one big beef: pictures. I remember reading a selection from Great Expectations during my freshman year of high school that I’d bet killed any nascent enthusiasm I might have had for the works of Charles Dickens. The reading was peppered with movie stills of Pip and Miss Havisham from a black-and-white production from the 1940s that, to a 14-year-old, made the story seem even more ancient than its 1861 publication date. Looking at the stills, I thought that if that’s what this story is supposed to look like, I wanted no part of it. I steered away from Dickens and, I am ashamed to admit, have not really ventured back since. Why have pictures at all in literature textbooks? Some books do not. 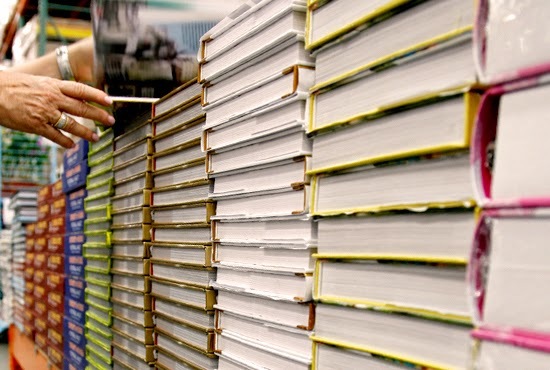 Readers for Advanced Placement courses tend to be more like anthologies than textbooks, with full-length works given context by simple introductions, author biographies and guiding questions. But these books present a sharp departure from what most high school students carry—thick volumes that, instead of supplementing works of literature with extraneous material, seem to have it the other way around. Flip through one and it’s sometimes difficult to find the readings themselves, truncated as they are, amidst the pictures and graphics and skill-building activity sidebars. If their teacher sticks to the textbook, it’s quite possible for students to march through four years without ever reading a full work of literature. Like captives trembling at the victor’s sight. As is not too difficult to see (especially after reading the entire poem), the sonnet is addressed to the “leaves” of the very book of poetry that Spenser is writing, and the word “lily” refers to the color of the hands of his beloved, whom Spenser imagines holding the poems. What picture does the textbook in question choose to put on the page for this poem (for every page must have a picture, it seems, lest the students lost interest)? A white flower with green leaves. A lily. Nowhere in the poem does it mention a flower. Not even close. A harried intern must have scanned the first line and thrown a stock image onto the page. Oh well, so much for editors. Not every picture is as blatantly misleading, but I would argue that they are just as harmful as Spenser’s phantom lily. One attraction of literature, which anyone captivated with a book at a young age knows instinctively, is this: a book presents a reality that is unique to the imagination of the reader. What does Odysseus look like? What do the sirens sound like? What does Telemachus’ face look like when he realizes that the beggar he had been talking to is his long-lost father? There are no authoritative answers to these questions, save for the ones that arise in each reader. In other words, there are as many answers as there are pairs of eyes. In this regard we are all equals. Though it may be more informed, Homer’s own personal envisioning of Odysseus is not “more real” than the sleepy student’s in the back row. This is an immensely liberating reality of books, one so fundamental that it hardly needs to be explained. Textbooks with pictures undermine this reality by presenting a version of the story (or poem, or play) that, by the very nature of textbooks, offers itself as the most real. Most students cannot distinguish between the work of literature itself and its appearance in a textbook. Like my 14-year-old self, they cannot understand that a novel or play had a life all of its own before an editor decided to cut it, clutter it with graphics, and, just when you thought the story was done, wrap it up with a nauseating discussion question (“How did you feel when character X….?”). That liberating reality of reading that every student should be able to count on—that the characters and settings become his/her own—is stifled before it even has a chance to take root. This is especially true with high school readers who struggle. In such textbooks, they are presented with stories whose “reality” (as seen in the ancillary images) appears to be more real than what their own imaginations produce. The result? They turn their imaginations off, and reading becomes an even bigger chore because now it becomes about learning about Odysseus or Macbeth or Miss Havisham, rather than imagining them. Cultivating mystery in our students depends on which works of literature we teach, but more so, how we teach them. At the risk of sounding formulaic, I’ll say that we in Catholic schools need to get away from literature textbooks, especially the mass-market ones, which, more often than not, strangle the imagination, choking off the point of access to the inner life. If we hope at all that our students grow in this regard, we must offer them those kinds of encounters with literature that bear interior fruit. Only then can they start to envision the world as sacramental, to consider the possibility that our inner and outer lives are wound up together in some strange, profound way.